Each week I welcome an author to share a first meeting excerpt. 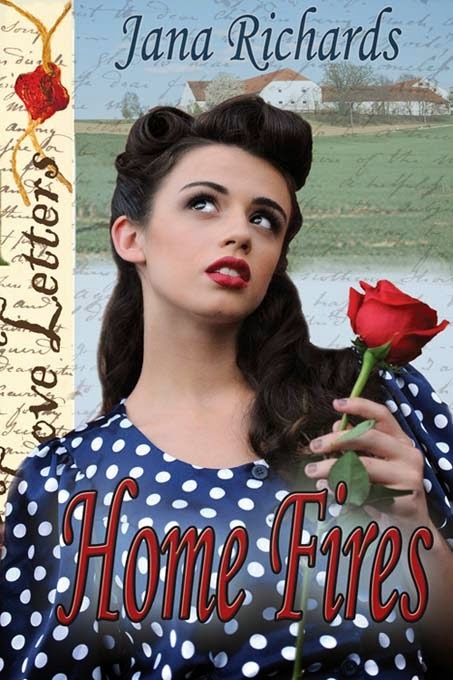 Today on First Sight Saturday, Jana Richards entertains us with a scene from Home Fires, a historical romance set just after World War Two. Jana’s fun fact: I’ve always been fascinated by the events of World War Two. My father was in the war. He participated in the Normandy Invasion on D-Day on Juno Beach with other Canadian soldiers. Four days after the invasion, he was taken prisoner by the Germans and remained a POW until the end of the war in Europe. Home Fires tells the story of Anne Wakefield, a young British woman who travels to Canada after World War Two to marry her fiancé. Though Anne and her story are fictional, the phenomena of War Brides is not. Some 48,000 women married Canadian servicemen during the war. The majority of war brides were British, but some came from France, Belgium, Norway, Sweden, Italy, the Netherlands, and Germany. Between 1942 and 1947, these women, along with their 22,000 children, traveled to Canada to begin their new lives. Anne Wakefield checked the clock in the Emerald train station’s waiting room, her stomach clenched with anxiety. She’d been waiting nearly an hour and there was no sign of Anders. With every second that passed, her fear increased. Had he been in an accident? Did his car break down? Or had he decided an English bride was no longer part of his plans? The station master looked at her, then at his pocket watch, his eyebrows rising as if he too had his doubts about her fiancé. Anne turned away, embarrassed. The last telegram she’d received from Anders said he would pick her up at the train station in his home town of Emerald, Saskatchewan, a tiny village on the Canadian prairies. From there he would take her the two miles to his family’s farm. But he still hadn’t arrived. She remembered Grace, one of the other young British women who’d traveled with her on the special war brides train across Canada. When they’d arrived in Toronto and her husband wasn’t there to meet her, Grace phoned his home only to be told to go back to England because he didn’t want her anymore. The Red Cross had made arrangements for Grace to go back to England. Anne closed her eyes and took a deep breath. Was Grace’s fate to be hers as well? The door to the station opened and a tall, powerfully built man entered. Anders! She jumped to her feet and took several steps toward him before she realized the man wasn’t her fiancé. Though he had the same broad shoulders, and carried his height with the same pride, this man used a cane and walked with a pronounced limp. When he removed his cap she saw his hair was dark brown instead of blond like Anders’s. A jagged scar ran down the left side of his face from temple to jawline. Profound disappointment made it almost impossible for her to speak. Anne lifted her head and looked into eyes the same icy blue as Anders’s. But where her fiancé’s eyes laughed and teased, this man wore an expression of seriousness. She wondered if he ever laughed. Erik glanced at the station master. Anne followed his gaze. The man nodded at them, making no effort to hide the fact that he was avidly listening to their conservation. Anne stared at him for a moment, dread building inside her. What news was so awful it had to be delivered in private? Anne retrieved her coat and purse and followed him out the door while the station master directed a young man to carry her small trunk. Erik struggled with her suitcase, leaning heavily on his cane, but she stopped herself from offering to take it from him. Her wartime experience as a nurse had taught her that injured soldiers didn’t want to be treated as invalids, or worse, as useless burdens. She waited for him to say something more, but he was silent until they reached an old farm truck. While Erik and the young man hoisted her luggage into the back, Anne climbed into the truck. A moment later Erik pulled himself up into the cab, a move that caused him pain, if the tight expression on his face was any indication. She looked away, not wanting to be caught staring. Though she’d just met Erik Gustafson she already knew he wanted no pity from her. Jana and I both welcome your questions and comments. Make sure you come back each week for a new first meeting excerpt from a fresh author.